The yo-yo is one of the oldest toys in history. 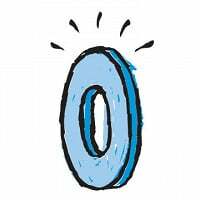 It’s easy to start learning, yet it’s not simplistic -- you can work your way up a scale of increasingly difficult and impressive tricks, honing your skills along the way. We’re partial to Henrys Lizard, which has a slightly non-traditional shape with its starburst hubs and rubber edges. 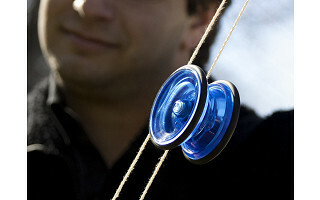 German-engineered Henrys yo-yos are known for their AXYS axle system, which makes every toss of the yo-yo feel smooth. Henrys also makes the Vision diabolo, a juggling toy that consists of a spool, string and two sticks. The string is tied between the two sticks, and by manipulating the tension and rolling the spool, the user can perform an incredible variety of whirling, pumping and tossing tricks. We discovered both spinning wonders thanks to Jim Henry, who spends a lot of time looking skyward. Jim’s passion for kites led him to start a competitive stunt kite team and inspired his foray into retail. Today his Minneapolis toy store, Air Traffic, specializes in yo-yos, juggling gear and other skill-based toys and games. If you like to send things flying, Jim’s your guy. So many toys nowadays depend on batteries, screens or speakers. The Henrys Lizard yo-yo and Vision diabolo are uncomplicated classics that deliver loads of fun plus a challenge to sharpen your skills and increase your repertoire of tricks. It’s time to get tossing! Want to have the world on a string? We’ve got the string. We've also got two products of fine German engineering to put on the string. I’ve spent the last 25 years witnessing hundreds of people throw, swing, catch, drop and fling, with a smile on their face, and a glow of pride. It’s great! Today the Daily grommet has chosen to present the Vision Diabolo and the Lizard yo-yo with hopes many more will fling, spin or toss their way to a smile. I'd guess that the best way to learn is to play with them, but if we buy the toys are there any books or videos which would help our 11 year old learn the nuances of doing basic moves and then progress to tricks? Thanks. @ Nancy Hi Nancy, Great question. Jim had to step out for a few minutes but should be back with that answer shortly. @ Nancy . The Lizard comes with a very good basic instruction booklet. For the diabolo this website has many videos posted by diabolo players from around the world. They also have a tutorial link for more basic how to instructions. And of course, there are large amount of youtube based videos that will keep your son very busy trying to learn what he sees on the screen. The yo-yo is one of the oldest toys in history. It’s easy to start learning, yet it’s not simplistic -- you can work your way up a scale of increasingly difficult and impressive tricks, honing your skills along the way. We’re partial to Henrys Lizard, which has a slightly non-traditional shape with its starburst hubs and rubber edges. 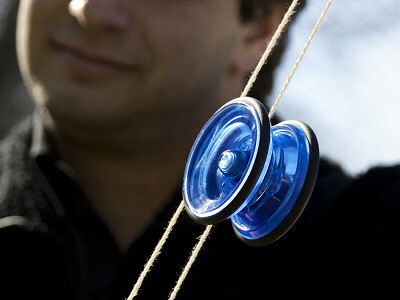 German-engineered Henrys yo-yos are known for their AXYS axle system, which makes every toss of the yo-yo feel smooth. Henrys also makes the Vision diabolo, a juggling toy that consists of a spool, string and two sticks. The string is tied between the two sticks, and by manipulating the tension and rolling the spool, the user can perform an incredible variety of whirling, pumping and tossing tricks. We discovered both spinning wonders thanks to Jim Henry, who spends a lot of time looking skyward. Jim’s passion for kites led him to start a competitive stunt kite team and inspired his foray into retail. Today his Minneapolis toy store, Air Traffic, specializes in yo-yos, juggling gear and other skill-based toys and games. If you like to send things flying, Jim’s your guy.